The present study documents the ethnomedicinal knowledge among the traditional healers of the Pangkhua indigenous community of Bangladesh. The documented data from this area was quantitatively analyzed for the first time. We aimed to record ethnomedicinal information from both the traditional healers and also the elderly men and women of the community, in order to compile and document all available information concerning plant use and preserve it for the coming generations. We aimed to compare how already known species are used compared to elsewhere and particularly to highlight new ethnomedicinal plant species alongside their therapeutic use(s). All ethnomedicinal information was collected following established techniques. Open-ended and semi-structured techniques were primarily utilized. Data was analyzed using different quantitative indices. The level of homogeneity between information provided by different informants was calculated using the Informant Consensus Factor. All recorded plant species are presented in tabular format, alongside corresponding ethnomedicinal usage information. This investigation revealed the traditional use of 117 plant species, distributed among 104 genera and belonging to 54 families. There was strong agreement among the informants regarding ethnomedicinal uses of plants, with Factor of Informant Consensus (FIC) values ranging from 0.50 to 0.66, with the highest number of species (49) being used for the treatment of digestive system disorders (FIC 0.66). In contrast, the least agreement (FIC = 0.50) between informants regarding therapeutic uses was observed for plants used to treat urinary disorders. The present study was compared with 43 prior ethnomedicinal studies, conducted both nationally and in neighboring countries, and the results revealed that the Jaccard index (JI) ranged from 1.65 to 33.00. The highest degree of similarity (33.00) was found with another study conducted in Bangladesh, while the lowest degree of similarity (1.65) was found with a study conducted in Pakistan. This study recorded 12 new ethnomedicinal plant species, of which 6 have never been studied pharmacologically to date. This study showed that the Pangkhua community still depends substantially on ethnomedicinal plants for the treatment of various ailments and diseases and that several of these plants are used in novel ways or represented their first instances of use for medicinal applications. Traditional herbal medicine in Bangladesh has strong cultural and religious foundations. It manifests in different ways among indigenous groups in their ritual or ceremonial practices, spiritual practices, and self-healing practices. Indigenous communities have utilized this local knowledge for centuries to cure different diseases. Reportedly, more than 80% of the Bangladeshi use non-allopathic medicines (Ayurveda, Siddha, Unani, and homeopathy) for their healthcare, with herbs constituting a major ingredient of these alternative systems of medicine . Bangladesh is a country that is considered rich in medicinal plant genetic resources, by virtue of its favorable agroclimatic conditions and seasonal diversity. With productive soils and a tropical climate, more than 5000 angiospermic plant species have been recorded in the country , of which about 250 have documented use in traditional medicine systems . About 75% of the country’s total population lives in rural areas, and almost 80% is dependent on natural resources (e.g., medicinal plants) for their primary healthcare needs . Rural/indigenous peoples are capable of identifying many species of plants yielding various products, including food, firewood, medicine, forage, and tools for daily needs. With such a high demand for herbal medicines, the medicinal plant sector has been cited as the most promising business sector in Bangladesh , with more than 500 companies producing herbal medicines, yet despite the biodiversity described above, more than 90% of the plants and products needed to meet domestic demands are imported from other countries, such as India, Nepal, and Pakistan. Many indigenous Bangladeshi live in deep forest zones. They include those people living within the three Chittagong Hill Tract districts (CHTs) of south-eastern Bangladesh, within which there are 12 indigenous communities . The smallest of these communities is the Pangkhua, who dwell in the remote Pangkhua paras, an isolated part of the Bilaichari Upazilla of the Rangamati CHT. In the wet season, the only way to reach Pangkhua paras is by motorboat, taking 6 h, while in the dry season it takes more than 8 h on foot. Like other remote communities, the Pangkhua have their own distinct traditional healthcare system and practices. In fact, the nearest conventional medicine facility is in Belaichari Upazilla sadar, the only Government health facility nearby (about 15 km), with basic health facilities. Services there are provided by two medical practitioners alongside three paramedics. The Pangkhua people thus have inadequate access to modern treatments, and in any case, allopathic medicine is largely unaffordable to them. Traditional medicinal knowledge, on the other hand, is orally transmitted from one generation to the next. Typically, every elderly man and woman of the community can prepare herbal formulations for the treatment of common ailments, such as fever, cough, cold, dysentery, diarrhea, and gastritis. Typically, they visit professional healers only when they suffer from more serious symptoms or conditions, such as jaundice, cholera, malaria, or cancers. The headmen (karbari) of each village also act as professional healers. In fact, many Pangkhua believe that they lose their community spirit if they receive allopathic care. Local government has had to enforce modern treatment in instances of contagious disease. Several studies on ethnomedicinal plants of Bangladesh have been conducted in the past, and comprehensive works have already been published [7–13]. However, few studies focus on the Rangamati district [10, 14, 15] with almost nothing on the Pangkhua indigenous community. With this in mind, the Pangkhua indigenous community was selected for the present study, as their ethnomedicinal practices have not been thoroughly investigated to date. It was important to ascertain who among them represent the custodians of such knowledge and to document their uses of medicinal plants. To the best of our knowledge, this is the pioneer quantitative documentation of medicinal plants in the studied area. The present study was carried out in the Pangkhua areas of the Belaichhari Upazila within the Rangamati District (Fig. 1). This district is part of the Chittagong division and Chittagong Hill Tracts. Belaichhari thana (now an upazila) was established in 1976. It consists of 3 Union parishads, 9 mouzas and 30 villages. 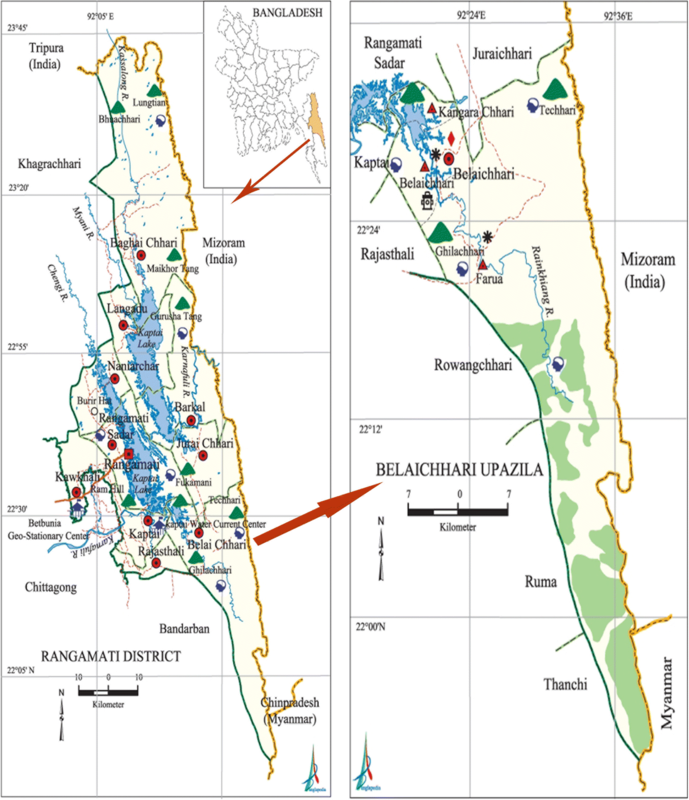 The Belaichhari Upazila is situated approximately between 20° 50′ and 22° 35′ N latitude and between 90° 38′ and 92° 17′ E longitude. The Rainkhiang is the main river of the upazilla. The district lies in the south-east of Bangladesh and has a tropical monsoon climate. There are three main seasons: the dry season (November to March), which is sunny and dry; the pre-monsoon (April to May), which is very hot and sunny with occasional showers; and the rainy season (June to October), which is warm, cloudy, and wet. Temperatures of the Belaichhari Upazila are moderate, with a mean monthly average temperature in Rangamati of 25.8 °C and annual monthly average temperatures ranging from 13.4 to 34.6 °C. The mean annual rainfall is 2865.4 mm, with mean monthly maxima and minima of 679 mm (July) and 7.4 mm (January), respectively . The success of ethnobotanical documentation depends on the cooperative relationship between the researcher and local informant. Knowledgeable informants are very important for the study of ethnobotany [17, 18]. Various techniques are recommended for ethnobotanical studies, including (i) direct or participant observation, (ii) checklist interview, (iii) group interview, (iv) field interview, (v) plant interview, and (vi) market survey [19, 20]. All of these techniques were followed in this study except the use of checklist interviews. The interview is a dynamic process involving spoken interactions between two or more people. In general, open-ended and semi-structured techniques were followed. Initial contacts are very important to understand an area and its people. Initial contacts were made with headmen, teachers, and students within the area to select informants. Upon identification of informants, if necessary, interpreters were also appointed. Ethnobotanical information regarding the usage of medicinal plants available in the local area for treating various ailments and diseases was collected through direct interviewing of traditional healers and other informants possessing traditional knowledge about medicinal plants. During the interviews, information was noted using data documentation sheets; in addition, audio recording was performed with a digital voice recorder. Contact in the field was conducted over a total of 43 days, in different seasons, with interviews conducted in the Chittagonian language, accompanied by a local student (Bathue Pankhua) and with consultancy with a local doctor (Dr. Mizanur Rahman). The level of homogeneity between information provided by different informants was calculated using the factor of informant consensus (FIC) [21, 22]. It is calculated as FIC = Nur – Nt/(Nur – 1), where Nur is the number of use reports from informants for a particular plant-use category and Nt is the number of taxa or species associated with that plant-use category across all informants. FIC values range between 0 and 1, with FIC = 1 indicating the highest level of informant consensus. A high value (close to 1) indicates that relatively few taxa (or, more usually, species) are used by a large proportion of informants, while a low value indicates that informants differ on the taxa to be used in treatment within a category of illness. Therefore, if informants use few taxa, then a high degree of consensus is reached and medicinal tradition is thus viewed as well-defined . JI = C × 100/A + B − C, where, A is the recorded number of species of the current study area a, B is the documented number of species of another study area b, and C is the number of species common to both areas a and b. The ethnobotanical survey was carried out three times during summer and winter seasons from January 2016 to September 2017. All plant materials were collected and identified through expert consultation, by comparison with herbarium specimens and through use of literature references. Following preservation, plant materials were numbered and deposited as voucher specimens in the Chittagong University Herbarium. Descriptions and current nomenclature were compared with the recent “Dictionary of Plant Names of Bangladesh-Vascular Plants”  and with www.theplantlist.org. The ethnomedicinal value of each plant was cataloged as follows: botanical name (with voucher number in brackets), Bangla name, Pangkhua name, family, habit, plant part(s) used, disease(s)/illness treated, usage information, and prior documentation in the allied literature (Table 1). A decoction of the rhizome is taken at a dose of one cupful daily for 7 days to treat gastritis, and as an anthelmintic. Juice of the fruit is taken (as much as possible) for 7 days as a digestive. A decoction of green fruits along with the bark of Terminalia arjuna is taken at a dose of one teaspoonful twice daily to treat asthma. Leaf juice, along with honey and other (unknown) ingredients is ktaken at a dose of one cupful daily to treat asthma. A paste of the leaves is smeared around the vaginal area to treat leucorrhoea. Juice of the leaves is applied to burns. A decoction of the rhizome is taken orally for 5 to 7 days at a dose of one cupful three times daily for the treatment of diarrhea. The same dose is given for 3 to 4 days in dysentery. A decoction of the rhizome with honey is taken at a dose of one teaspoonful three times daily for 3 days. A decoction of the plant is taken for kidney problems. Boiled plants are taken directly: as much as possible is consumed to treat fever; the juice of the plant along with other (unknown) ingredients is given for the treatment of jaundice. A decoction of the plant is taken to treat diabetes. Leaf juice along with sugar or molasses is applied to eczema. A decoction of leaves is taken in dysuria. The root is directly eaten for menstrual problems. A decoction of the root is given at a dose of one cupful twice daily for the treatment of cancer and ulcers. A paste of the plant is applied to burns, and the same formulation, along with mustard oil, is applied to treat backache. The juice extracted from the tuber is given for the treatment of diarrhea. A bark decoction is taken in cases of dysentery and diarrhea. One teaspoonful of juice from the leaves and fruit is taken once daily for 3 days as an anthelmintic. A decoction of the fruit (about 3 teaspoonfuls three times daily for 7 days) is prescribed to cure menstrual problems and high fever. Fruits are taken as a carminative. One cupful of the leaf decoction is taken twice daily before meals for 15 days to treat ulcers. A paste of the young leaves is applied to the affected areas of skin. Boiled leaves and bark are used in a bath for the treatment of scabies. A decoction of the leaves is taken in malaria. A paste of the plant is rubbed on the affected area in skin diseases. A decoction of the plant is taken with honey to treat diarrhea and pneumonia. Boiled leaves are used in a bath for the treatment of scabies. A decoction of the root is boiled with coconut oil and applied to burns. A decoction of the preparedroot is given to treat respiratory problems. The juice of the leaves is taken at a dose of one teaspoonful daily for 7 days for relief of rheumatic pain. A decoction prepared from the plant is taken to treat coughs and colds. A paste of the leaves is applied to wounds and cuts to stop bleeding. two to three drops of fresh leaf juice is dropped into the eyes in chronic eye disease. Two teaspoonfuls of leaf juice are taken three times a day for 10 days as an anthelmintic and to treat cough. Two to three teaspoonfuls of root juice are taken twice a day to treat gonorrhea. A decoction of bark with honey and salt is taken orally at a dose of one cupful twice daily for 7 days. An infusion of the root is applied in skin disease. A decoction of the root is taken to treat pneumonia. Juices prepared from bark and seed are used as an anthelmintic and to treat dysentery. In addition, a decoction of the bark is taken to treat urinary infections and cough. One cupful of leaf extract is taken twice a day for 5 days before meals in gastritis. Cooked seeds are taken directly to treat jaundice. A decoction of the stem is taken at a dose of one cupful twice daily for 7 days. Leaves are applied to the affected area twice a day for 3 days for the treatment of rheumatic pain. Flower extracts are used in asthma. A decoction of leaves is used to treat snake bite. Two teaspoonfuls of the rhizome extract are taken once daily for 5 days early in the morning before meals, as an anthelmintic and to treat asthma. Ripe fruits are eaten directly as a digestive. Boiled green fruits are taken with leaves of Centella asiatica to treat dysentery. An extract of the fruit is taken at a dose of one cupful three times daily to treat jaundiced patients. The bark juice is used for the treatment of dysentery in cattle. 2–3 drops of plant juice are dropped twice daily into the eyes to treat conjunctivitis. The whole plant is eaten (as much as possible) as a vegetable to treat dysentery and impotence. A decoction of the whole plant, along with honey, is taken to treat asthma. The juice of leaves and stems is taken at a dose of one teaspoonful three times daily for 3 days to treat ear pain. A leaf decoction is taken orally to treat coughs and colds. A paste of the root is applied to dog bites. The fruit juice is taken to treat malaria. The leaf paste is rubbed to the forehead in patients with headache. For treatment of fever and cough, fruits are directly eaten with a trace amount of salt and red chili. A leaf extract is taken as an anthelmintic; the leaf juice is taken at a dose of two teaspoons three times daily for 7 days to treat cough and dysentery. A decoction prepared from the leaves is given to treat cough and asthma. Baked leaves are applied in joint pain. Green coconut water is taken as a carminative and digestive, and is also taken during fever. An extract prepared from tender stems is applied to the ear for the treatment of boils. Dry fruits are eaten with betel leaf to obtain relief from stomachache. The plant extract is taken as a remedy for stomach pain. An extract of the leaves is taken three times a day for a week for the treatment of urinary problems and high blood pressure. A root extract is taken at a dose of one cupful daily for 15 days to treat indigestion. The fruit pulp is useful in burns and boils. The young leaves, flowers and fruits are cooked as vegetables. Fried seeds are eaten. Fruits are boiled to make smashed (bharta). The fruit skin is also cooked as a vegetable. A rhizome decoction is used orally, at a dose of one teaspoonful twice daily with cow’s milk to treat fever. A paste of the rhizome is used to treat tumor and snake bite. The rhizome is cooked and taken to treat dysentery. Flowers are used as additives in curries. A paste of the rhizome is used for the treatment of eczema; juice of the rhizome is taken (one teaspoon three times a day for 7 days) to cure cough, colds and fever and is also taken as a laxative. A decoction of the rhizome is given in diarrhea. Flowers are directly eaten with rice to treat coughs. A decoction prepared from the whole plant mixed with rice-washed water is taken at a dose of one cupful three times daily until cure, in cases of diarrhea and dysentery. The powdered seed is applied in bronchitis and whooping cough. The seed oil is taken as an anthelmintic. Boiled tubers are taken as an anthelmintic. A paste prepared from the leaves is used to treat dog bites and fever. A decoction of the bulb is taken at a dose of about 100 ml per day for 10 days in asthma. A paste of the bulb is taken with honey to treat cough. The fruit is taken to treat dysentery and diarrhea. The seed oil is used to lessen inflammation due to rheumatism. The seed oil is also used to treat various skin diseases. In addition, the warm seed oil is used to massage the chest of children to treat cough. A seed paste is used to treat joint pain. A root extract is taken at a dose of two spoonfuls three times daily for 10 days to cure diarrhea. A decoction of leaves is taken, at a dose of about 30 ml twice daily for 3 days, for abdominal pain and cancer. Juice of the leaves is taken to treat diarrhea. Fruits are cooked with other (unknown) ingredients and consumed as vegetables, taking as much as possible for 1 month to treat jaundice and fever. A paste of the fruits is smeared to treat tumors. Leaves are used to treat skin diseases. A paste prepared from the seeds is taken as a carminative. An extract of the leaves is used for the treatment of rheumatic pain. Leaf juice is taken at a dose of two teaspoonfuls twice daily for 7 days to treat skin diseases. A decoction of the rhizome is used to treat diarrhea. A decoction of the leaves is mixed with other (unknown) substances and honey, and is taken at a dose of one cupful daily to treat jaundice. An extract of leaves is taken at a dose of one teaspoonful three times daily after meals for 2 months to treat malaria. A paste of the seeds is used to treat coughs and colds. A paste of the flowers is used in piles. A decoction of the flowers is taken at a dose of one cupful twice daily until cure of leucorrhoea is observed. A decoction of the plant is taken to increase sexual desire. A soft drink prepared from the seeds is taken, consuming as much as possible to treat constipation. The leaf juice is taken at a dose of two teaspoonfuls daily for 10 days for the treatment of tumors. A decoction of the root with honey is taken at a dose of one teaspoonful twice daily for 3 days, to cure fevers and cough. Tubers are used for the treatment of sexual disabilities. A paste prepared from the flowers is applied in skin disease. A decoction of flowers with mustard oil is taken in asthma. Two to three drops of the leaf extract are dropped into the eyes for the treatment of conjunctivitis. The leaf extract is taken at a dose of three teaspoonfuls once daily for 5 days, to treat bronchitis and high blood pressure. A paste of the leaves is applied to the affected areas of eczematous skin. The same formulation along with honey is also applied to ringworm. An extract of the leaves is taken at a dose of one cupful daily for 15 days to treat piles. A paste of the leaves is used to treat fractures of bone. The leaves are used in dysentery and gastric ulcers. A decoction of the leaves is considered useful in dyspepsia. Crushed fresh leaves are applied to cuts and wounds to stop hemorrhages. An extract prepared from the root is taken twice a day for 1 month to treat piles and dysentery. A decoction of the root, along with unknown ingredients, is taken at a dose of one cupful twice daily to treat cancer. An extract of the root is directly taken to treat cough. The fruit is taken as a curry, which is useful in dysentery, fever and jaundice. The leaves are used as an anthelmintic. The young leaves are eaten as leafy vegetables to treat jaundice and pneumonia. A powder prepared from the dry leaves is applied to the affected area as a remedy for toothache and also used as stimulant. The leaves are used in curries as an additive for aroma. This species is planted in home gardens for its pleasant smell and also as an ornamental. The leaves are used for the treatment of diarrhea, dysentery and bronchitis. A paste prepared from the leaves is used to treat coughs and colds. The root extract is taken as an anthelmintic. A beer prepared from rice is taken to prevent malaria. In addition, the aqueous liquor from steeping rice in water overnight is taken to treat abdominal pain. Whole plants are wrapped in banana leaves and heated for 10 min. An extract of the prepared plant is poured (2–3 drops) into the eyes, to treat eye disease. A decoction of the whole plant is taken (as much as possible) to treat tuberculosis. A paste of the plant, along with leaves of Paederia foetida, is smeared on tumors. Fruits are eaten to treat gastritis and high blood pressure. Leaves are used for the treatment of indigestion, colic, diarrhea and headache. Leaves are also used as a masticatory substance and stimulant. The fried seed paste is used for toothache and asthma. Green and ripe fruits are eaten to cure diarrhea. A decoction of the bark is used in dysentery. A decoction prepared from the bark, along with leaves of Centella asiatica, is taken orally at a dose of one cupful twice daily for 7 days to treat leucorrhoea. Juice of the bark is taken in diarrhea. The leaf juice is taken to treat ringworm, while young leaves are used to treat eczema. The juice of the leaves is taken once daily for 3 days, along with beet salt, to treat jaundice and malaria. The juice of the fresh leaves is used as an anthelmintic and to treat colds. An extract of leaves and stems is mixed with black pepper and taken three times daily to treat ulcers. Unripe fruits are cooked as vegetables and are taken for the treatment of gastritis and fever. A paste prepared from the whole plant is used to treat scabies and colic. Fruits are eaten. The unripe fruit is useful for rheumatism and sore throat. Leaf juice is taken early in the morning for relief of urinary problems. Bark is used as an anthelmintic and for blood dysentery. Ripe fruits are eaten as an anthelmintic. A paste of the leaves is given at a dose of one teaspoonful three times daily to treat blood dysentery. The leaf paste is applied to fresh cuts to stop bleeding. A fruit decoction is used orally to treat diarrhea, dysentery and cough. An oily product from stem chips is used in eczema and ringworm. The bark is considered useful in ringworm and diarrhea. The leaves are used in the treatment of jaundice and tuberculosis. The seed oil is used to treat scabies, eczema and other skin diseases. Ripened green fruits are taken for the treatment of gastritis. A decoction of fruits with honey is taken at a dose of one teaspoonful three times daily in asthma and bronchitis. A paste of the fruit is smeared around the vaginal area to give relief from pain during menstruation. A paste prepared from the root and fruits is applied to snakebite. Juice of the flowers, with mustard oil, is taken to treat cough and fever. The bulb extract is used for the treatment of asthma and dysentery. The rhizome is used as a spice, while leaves are used as an additive, stimulant, for abdominal problems and as a laxative. An infusion of the rhizome is used in dyspepsia, cough, bronchitis, asthma, dysentery, vomiting and tuberculosis. A total of 218 people, including traditional healers and other community members, mostly the elderly men and women, with ages ranging from 27 to 86 years were interviewed, and of them, the majority (65.6%) belonged to the age group of 51–70. We considered as informants those reporting one or more ethnomedicinal uses of a species (see Additional file 1 as an example). Demographics by gender, age, education, and occupation of participants are summarized in Table 2. Detailed clarification of informants is presented in an additional file (see Additional file 2). The present investigation details 117 species of ethnomedicinal plants distributed across 104 genera and belonging to 54 families (Table 1). The highest numbers of ethnomedicinal plants recorded were from the Fabaceae (12 species). The second largest used families represented were the Asteraceae and Zingiberaceae (10 species each), followed by the Lamiaceae (5), Caesalpiniaceae (4), and Amaranthaceae, Apiaceae, Cucurbitaceae, and Poaceae having 3 species each. The remainder of families was represented by two or one species. However, most of these families are documented to contain active constituents and feature in different traditional systems of medicine. Of all recorded species, herbs (55 species) were found to account for the greatest number, followed by trees (35 species), shrubs (13 species), climbers (10 species), and under-shrubs (4 species). Different parts of ethnomedicinal plants are used in herbal formulations by local traditional healers for the treatment of different ailments. Among such plant parts, leaves (34.07%) were found to be the most frequently used for the preparation of herbal drugs, followed by other parts (Fig. 2). Considering the mode of preparation of traditional medicines by the Pangkhua community, the range of methods reported for various species included decoctions, juices, extracts, pastes, powders, infusions, oils, and the use of fresh plant parts. Among these, the most common formulations were decoctions (25.93%) and fresh plant parts (23.46%), followed by juices (16.05%), pastes (14.81%), extracts (13.58%), oils (3.70%), and infusions and powders (1.23% each). Decoctions are often the most commonly encountered preparation method reported [26–30]. In some cases, processing involved drying of the plant material followed by grinding into a fine powder. Water was most commonly used if a solvent was required, with cow’s milk or honey sometimes used as a matrix or as an adjuvant to increase viscosity. Within the study community, plant medicines were usually administrated orally. Bathing in a decoction or rubbing and massaging using the plant parts were also encountered. The conservation status of all recorded plant species was checked using the International Union for Conservation of Nature (IUCN) Red List of Threatened Species . A total of 12 species, namely Acorus calamus, Amorphophallus paeoniifolius, Ammania multiflora, Azolla pinnata, Breonia chinensis, Centella asiatica, Cyperus rotundus, Commelina diffusa, Hygrophila difformis, Lasia spinosa, Mimosa pudica, and Ottelia alismoides were recorded as “of Least Concern,” while only one species (Saraca asoca) was recorded as “vulnerable,” with all other species not included on the list. The present study records the use of ethnomedicines to treat 11 categories of ailments. Of these, the most common uses were for digestive system disorders (49 species), followed by respiratory complaints (39 species) (Table 3). To ascertain the level of agreement among the informants of the Pangkhua community regarding the use of plants to treat certain disease categories, FIC values were determined. The FIC values are presented in Table 3. It is clear that the FIC values showed variation, varying from 0.50 to 0.66. In the treatment of digestive system disorders, the highest FIC value (0.66) was encountered, with 141 use-reports for 49 plant species. This was followed by plants used to treat respiratory system disorders (FIC = 0.64) and so on (Table 3). In contrast, the least agreement (FIC = 0.50) between informants regarding therapeutic uses was observed for plants used to treat urinary disorders. The calculated JI indices (Table 4) ranged from 1.65 to 33.00. The highest degree of similarity was found with a study conducted in Bangladesh, while the lowest degree of similarity was found with a study conducted in Pakistan. Digestive system disorders: diarrhea (patla paikhana), gastritis (gastic, petod gas), dysentery (bikar, amasha), carminative (hozmi, petod gas komibo), digestive (hozomi), ulcer (petod gha), vomiting (bomi), indigestion (hozom n hoile), piles (arsha), constipation (paikhana kosha), anthelmintic (krimir osod), dyspepsia (hozom n hoile), laxative (paikhana norom goribellai). Respiratory disorders: cough (kof), colds (thanda), pneumonia (newmonia), bronchitis (jolkhashi), tuberculosis (jokkha), asthma (shash kosto), whooping cough (khungri khas). Skin diseases: eczema (kaur), ringworm (dad), boils (fura), scabies (chulkani), burns (pora), cuts (kata) and wounds (khoto/gha). Pain: Abdominal pain (tolpetod betha), backache (pit betha), earache (kanot betha), headache (matha betha), joint pain (girad betha), rheumatic pain (bater betha), sore throat (golat betha), stomachache (pedot betha), toothache (dat betha). General disorders: fever (jor), high blood pressure (pressure bari gele), colic (shul betha), stimulant (uttejok), conjunctivitis (chokh utha). Our comparative analysis revealed that out of 117 ethnomedicinal plant species documented, 37 species had either no similar or any use (Table 1). 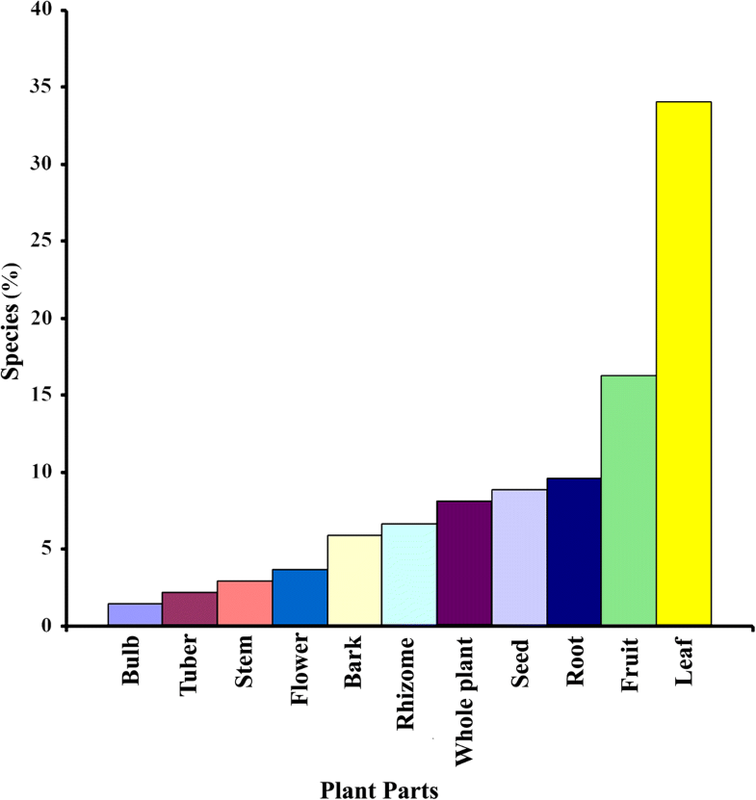 Therefore, these species were compared with the research databases of SCOPUS, PubMed, Biomed Central, and Google Scholar, and the results showed that use of 12 of these species has heretofore been unreported in Bangladesh (Table 5), while 6 species have never been screened pharmacologically. Overall, this study revealed the traditional use of 117 plant species, distributed among 104 genera and belonging to 54 families to treat 11 categories of ailments, recorded from 218 traditional healers and elderly men and women. The highest number of species belonged to the Fabaceae; this dominancy may be due to the worldwide distribution of species from this family [32, 33] and, furthermore, that the Fabaceae constitute the second largest family in the flora of Bangladesh . Similar results have been reported by other ethnobotanists [10, 27, 34] while  reported the Asteraceae as the largest family and the Fabaceae the third largest family in their study conducted in Bangladesh. Herbs are naturally abundant in the study areas, which were mostly hilly and covered by a forest canopy, creating favorable conditions for their growth. Similar results were observed with other studies conducted in different regions of Bangladesh [3, 27, 34–36]. The preference for the use of leaves in the preparation of herbal medicines by the healers is likely due to the year-round availability of leaves, and the fact that they are easier to collect, store, process, and handle. Similar observations have been reported in allied studies in Bangladesh and other countries [28, 35, 37, 38]. Healers usually however prefer to use fresh plant materials instead of dry and stored ones for herbal preparations. In the study area, digestive system disorders are common, largely due to a deficiency of pure water, especially in the dry season, coupled with a lack of awareness of its importance among those living in hilly and remote areas. Similarly, respiratory system disorders were second in occurrence, due to prevalence of smoking and chewing of leaves of Nicotiana tabacum with those of Piper betel. Analogously to our results, digestive system disorders were found to be the major ailment category in many other ethnomedicinal studies conducted in Bangladesh [7, 8, 14, 39, 40]. High FIC values also indicate that such species are worth investigating for bioactive compounds. As discussed earlier, some medicinal plant species used by the healers of the studied community are also used by the healers of different communities in different parts of Bangladesh as well as in neighboring countries and beyond. A total of 19 ethnomedicinal plant species which are commonly used by the indigenous communities of Bangladesh were selected and their known uses compared with our results (Table 6), to ascertain whether the Pangkhua community has any novel uses of these species. Alongside, we evaluated the phytochemical literature on these species. From our review, 11 species, namely Acorus calamus, Aegle marmelos, Arecha catechu, Calotropis procera, Centella asiatica, Curcuma longa, Justicia adhatoda, Phyllanthes emblica, Saraca asoca, Terminalia chebula, and Zingiber officinale have distinct uses within the Pangkhua community. For example, Centella asiatica is used analogously by the Marma community in Bandarban , the Rakhaing community in Cox’s Bazar , the Tripura community in Chittagong ; the local people in the Panchagarh , Garo, Hazong, and Bangalee communities in Durgapur ; the local people of 11 districts in Bangladesh ; and the ethnic people of western Nepal . This species was also used differently in traditional medicine by traditional healers of Bangladesh and other countries [37, 42–45]. Interestingly, its use in one ailment, asthma, has been documented for the first time in this study. Similarly, the use of Acorus calamus as an anthelmintic has not been reported before, and the use of fruit of Aegle marmelos to treat asthma is recorded herein for the first time, while its leaves were used in combination with other plants . Other unreported uses of established ethnomedicinal species include Arecha catechu as a carminative, Calotropis procera to treat asthma and snake bite, Curcuma longa as a laxative and to treat fever, Justicia adhatoda and Phyllanthes emblica to reduce high blood pressure, Saraca asoca to treat diarrhea and leucorrhea, Terminalia chebula to reduce pain during menstruation and to treat bronchitis, and Zingiber officinale as a laxative and to treat dyspepsia and tuberculosis. To illustrate homogeneity of use or otherwise, the JI was used to compare our study with 43 previous investigations. In total, the JI was calculated for 28 regions of Bangladesh with the Cox’s Bazar district emerging as the most similar to our study area with JI = 33.00, followed by the Panchagarh, Chittagong, and Bandarban districts (JI = 22.83, 19.44, and 18.80 respectively), while the lowest JI (2.77) was found with the study conducted by Rahman . The high JI may reflect that the study area is located in the same geological zone, with similar socioeconomic and cultural characteristics. On the other hand, among three neighboring countries (India, Pakistan, and Nepal), the highest similarity was found with the adjacent state of Tipura, India (JI = 11.74) while the lowest (JI = 1.65) was from Pakistan. Ethnobotanical documentation constitutes field-based research. Nevertheless, the field is not always a safe environment. A majority of the indigenous communities we studied live in forest areas, and there have been security risks due to rebel movement in these areas. It is risky to carry valuable field equipment like cameras, recorders, etc. Route access was limited to foot traffic. Language barriers were encountered, as most participants did not speak the national Bangla language requiring the use of interpreters. Seasonal variation is an important factor in the collection of voucher specimens, as in the rainy season it is difficult to both access and dry the specimens, while in the dry season the aerial parts of many plants have withered, coupled with the clearing of forest areas for cultivation during that period. Indigenous peoples are sometimes unwilling to share their knowledge of medicinal plants with others, specifically the Bangali (Bangladeshi). They maintain the secrecy of medicinal plant use because there is a belief among them that the medicines lose their efficacy if too many people know of them, and additionally, they may be conscious about economic losses . There may also be resistance to allowing themselves to become the subject of study by outsiders . Therefore, potential informants must be encouraged using several techniques. Firstly, emphasis must be given to help them understand that shared information will be preserved for the benefit of their children and future generations. As their children are less frequently adopting the role of healers, without documentation, much knowledge of medicinal plants may disappear forever. The present study revealed that the Pangkhua community depends on a variety of ethnomedicinal plants to treat various diseases. Local herbalists are predominantly aging men and women, and the Pangkhua younger generation lacks interest in following the traditional role of the healer. While in many cases, the plants utilized by the Pangkhua are documented in allied literature, their preparation, mode of use, and clinical indication often differ from that of other indigenous communities. The information compiled herein constitutes a rich knowledge source for taxonomists, phytochemists, environmentalists, pharmacists, and allied professionals. It can be concluded that the Pangkhua indigenous community of the Rangamati district of Bangladesh possess rich ethnomedicinal knowledge, as they use many medicinal plant species in their healthcare system. The novelty of this study is that 12 ethnomedicinal plant species have been recorded with new uses, and 6 of these species have never been screened pharmacologically. The traditional plants utilized have in some cases been validated scientifically by isolation of active ingredients, thus showing that traditional remedies are an important and effective part of indigenous healthcare systems in the district. Our findings will be helpful to ethnobotanists and phytochemists for conducting research into the isolation of active principles from these species. The preservation of these plant species is the gateway toward developing efficacious remedies for treating disease. Enhancing the sustainable use and conservation of indigenous knowledge of useful medicinal plants may benefit and improve the living standards of poor people. Hence, it is necessary to document the indigenous knowledge of useful plants and their therapeutic uses before they are lost forever. Mohammad Omar Faruque and Gang Feng contributed equally to this work. The authors express their deep sense of gratitude to the informants and the Bangali men and women who helped them in many different ways during the field work. The authors declare there is no actual or potential conflict of interest pertinent to this study. This research was supported by the Natural Science Foundation of Hubei Province, China, No. 2015CFA091 (XH), the Fundamental Research Funds for the Central Universities Program No. 2015PY181 (XH), No. 2662017PY104(XH) and National Key R&D Program of China 2017YFD0501500 (XH). All documented data will be included online at www.ebbd.info and www.mpbd.info. MOF, GF, SBU, and JB conceived and designed the experiments. MOF, MNAK, and URA collected the data. MOF, GF, SH, URA, and MK analyzed the data. MOF, JB, XH, and SBU wrote the manuscript. All of the listed authors have read and approved the submitted final manuscript. There are no formal rules and regulations governing consent from participants in Bangladesh regarding the sharing of ethnomedicinal knowledge. For the purposes of our study, a consistent approach was established. Each participant agreed to participate voluntarily. The research study was explained to all participants prior to interview. Participants were allowed to discontinue the interview at any time. For collecting voucher specimens, permission was taken from the appropriate body/owner/informants. IUCN: The IUCN Red List of Threatened Species. 2017. http://www.iucnredlist.org. Accessed 7 Feb 2018.